This can’t be called a full-scale recipe, it’s really just a useful alternative way to cook courgettes. I found it especially handy when my courgette plants suddenly decided to become surprisingly productive towards the end of the season. We’ve been told for years that vegetables should never be overcooked so this method sounds odd, but trust me, it really works. This healthy little dish can be used hot or warm alongside meat or fish (don’t overdo the mint and lemon if you’re serving it with subtly flavoured foods). It also works really well at room temperature as a part of a mezze – I think it’s a good alternative to the more common aubergine salad. I grew yellow courgettes this year and I think the colour’s very pleasing, but green courgettes will work just fine too. If you’ve let a few courgettes get a bit larger than usual, then you can still use them very successfully in this dish, but it would be best to scrape out and discard the seeds. The amounts given here will give you around 4 servings but they are just a guide and can be varied as the occasion and mood dictates. If you do end up with loads of courgettes then it’s worth knowing that this dish freezes well. Place the courgettes and lemon zest in a large saucepan and add a splash of water and some seasoning. Place on a low heat, cover and cook very slowly, stirring regularly. When the courgettes have completely softened and collapsed, which could take anywhere between 45 and 70 minutes, stir in the lemon juice. The courgettes will almost certainly have produced a lot of liquid, so take the lid off the saucepan and increase the heat. Continue cooking and stirring until the mixture has thickened to your liking. Stir in the mint and add more seasoning if it needs it (this dish can take plenty of seasoning). If the result is a little too sharp, then add a drop of honey. If you’re serving this as a salad, then a little drizzle of lemon-infused olive oil adds a nice finishing touch. 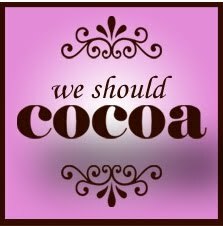 It’s the second birthday of the We Should Cocoa Challenge sent forth into the world by Choclette of Chocolate Log Blog and Chele of Chocolate Teapot. To celebrate this milestone Choclette has asked us to create something chocolaty inspired by a cocktail. I'm not really known for my consumption of cocktails. (Well, except maybe in the Epsom Bar in Dieppe – but let’s not go there. No wait, on second thoughts, let’s….). On the other hand, I’m deeply fond of an aperitif and the aperitif for me is the kir. Fortunately, when I looked at a very official looking web site on cocktails, I found the kir listed. Mel of Sharky Oven Gloves made lovely kir macarons for We Should Cocoa back in July using the classic crème de cassis and so I thought I’d create something inspired by my favourite alternative ‘kir’: crème de pamplemousse rose (pink grapefruit) with a dry rosé wine. (I'm eternally grateful to Catherine at l’Ombre Bleue chambres d'hôtes for introducing me to this little aperitif a couple of years ago). This is also a bit of an excuse to use the silicone savarin rings that I bought recently, but these little cakes don’t have to be made in rings – any small mould would do. This is pretty much my standard financier and friand recipe and it can be scaled up and flavoured differently with very little trouble. I filled the centre of the cakes with Greek yogurt, but whipped cream would be even more indulgent if you’d prefer indulgence. I topped the cakes with caramelised grapefruit segments. The caramelised bit isn't essential but it does create a nice contrast of flavours. This will make 12 cakes using individual savarin moulds of 7 cm diameter. Preheat the oven to 170°C. If the moulds you’re using aren’t silicone, then brush them thoroughly with butter. Sift the icing sugar, flour and ground almonds into a large bowl and mix together. Whisk the egg whites until frothy – don’t overdo it, though, they shouldn’t be stiff. Stir the egg whites into the dry ingredients until they're thoroughly combined, but, again, don’t overwork the mixture. Stir in the melted butter and the crème de pamplemousse or grapefruit juice. Lastly, stir in the chocolate and grapefruit zest. Spoon the batter into the moulds – they should be around ¾ full. Bake in the oven for 15 minutes until lightly golden and springy to the touch. Transfer to a rack to cool completely. To make the caramelised grapefruit, spread some icing sugar on a plate and move the grapefruit segments around in the sugar until they’re coated (it doesn’t have to be perfectly even). Place the segments in a dry frying pan over a moderate heat until the sugar caramelises on both sides – don’t overdo it or they’ll taste too bitter. Be careful when turning or lifting the segments because they’ll be very fragile. To serve, fill the hole in the middle of each cake with yogurt (or cream), carefully place a grapefruit segment on top and drizzle with a little more crème de pamplemousse, if you happen to have some. 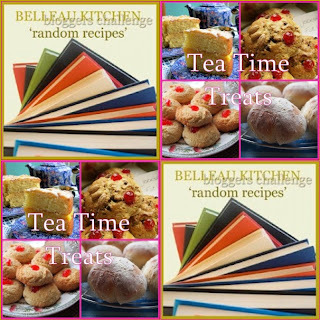 For this month’s Random Recipe challenge Dom of Belleau Kitchen has teamed up with the Tea Time Treats Challenge hosted by Karen from Lavender and Lovage and Kate from What Kate Baked. So from quite a small pile of suitable teatime books I randomly grabbed ‘The Sainsbury Book of Teatime Favourites’ written by Brian Binns and published in 1983. This was one of a series of little hardback books sold in the supermarket for the massive sum of 99p each. The books covered a wide range of different styles of cooking and the recipes were mostly sensible and straightforward but with a few slightly odd things thrown in now and then. (Anyone else remember eating the tinned soup, tuna and sweet corn bake topped with potato crisps?) The books sold by the shedful. Personally, I think this particular book was one of the best of the series. On opening the book at random, I found myself faced with Bolton Flat Cakes. The first thing to say about the flat cake is that it isn’t really a cake in the usual, modern sense. I recently posted a recipe for Eccles Cakes and I hope that I won’t offend anyone in Bolton if I say that these are in the same family (as are Chorley cakes and sad cakes). I was a little doubtful that I’d enjoy these but, actually, I thought they were lovely, old-fashioned treats – like portable versions of the jam tarts that I had as a kid. I’ve made a few minor adjustments to the recipe, most notably to the filling. Mr Binns used only jam in his filling and that may well be authentic. On the other hand, I’ve been told categorically that traditional flat cakes must contain some dried fruit. So I added some currants and I think it makes them even nicer. The type of jam isn’t specified and I’m sure it’s intended to be whatever you happen to have. Well, I had some of my wife’s homemade marrow and ginger jam and that worked really well. I’ve halved the quantities of the original recipe to make one cake. Put the flour and salt into a bowl and rub in the lard. Once the lard has been fully incorporated and the mixture feels a little like sand, then add the milk. Mix together until you get a smooth and cohesive dough. You may need a little extra milk to make the dough hold together, but don’t overdo it. Divide the dough into one piece of 125 g and one of 65 g. Form each piece into a ball, cover and leave to rest for 5 minutes. On a floured surface, roll out the larger piece until you have a round shape of about 20 cm diameter. Spread the jam over this round, leaving a border of about 1 cm. Scatter the currants over the jam. Roll the other piece of dough out into a round of about 18 cm. Dampen the border of the larger piece and lay the smaller round on top of the jammy dough. Turn up the edges of the larger round to seal up the jammy parcel. Preheat the oven to 180°C. Place the cake on a greased or non-stick baking tray with the smooth side uppermost. You need to be a little careful turning the cake over, but the pastry should be robust enough to stay together. Use a fork to prick a series of holes in the top and brush with milk. Bake in the oven for around 20 minutes until the cake is a pale golden colour. The cake can be eaten cold but is even nicer served slightly warm. Cut into wedges and spread with a little butter for extra richness, if you wish. My little veg plot has suffered a bit from neglect this year but in early summer I planted a couple of courgette plants (a variety called ‘Yellow Taxi’) and left them to get on with it. For many, many weeks it seemed to rain solidly every day and the courgette plants sulked. Then, around the end of July, they suddenly decided to produce very large numbers of lovely yellow courgettes. When I get a lot of courgettes, I start thinking about courgette cake. Savoury courgette cakes are nice but I really enjoy the sweet versions. The cakes can have a slightly off-putting green colour unless you remove the peel, but use yellow courgettes and that’s not an issue. There are plenty of courgette cake recipes around but this one from the Farrington Oils website is my current favourite. The use of cold pressed rapeseed oil together with grated courgettes gives the finished cake a nutty and herbaceous or almost grassy flavour which may not be to everyone’s taste but I think is a little different and absolutely delicious. The original recipe suggests a cream cheese filling and there’s nothing wrong with that, but I actually prefer a simpler jam or curd filling. I carried on with my recent gooseberry obsession by spreading the cake with some gooseberry and sloe gin jam. I just want to make it clear that I have no connection with Farrington Oils. I did use their oil in this cake but I went into a shop and bought it with real money just as if I were an ordinary person. Since I am independent and unbiased, though, I am happy to say that it is a very fine oil and I’m also perfectly happy to recommend Yellow Taxi if you want to try growing a yellow courgette in a neglectful manner.